You can submit online Assignments in Canvas using several submission types. Instructors can choose what kind of online submissions they want you to use. You may also have the option to resubmit assignments if your instructor allows. Any attachments added as part of a graded assignment submission are also copied to your user files but are not counted against your user quota. However, once the file has been uploaded as a submission, you cannot delete the file. Files are stored in the Submissions folder. 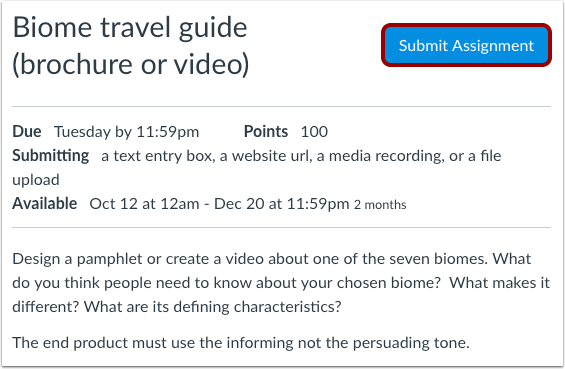 Before submitting an assignment, you may want to review all assignment information, such as the assignment rubric, if any. This lesson shows how to turn in a standard online assignment. Learn how to submit a peer review assignment. You can also submit assignments using your Android or iOS device. Not all file types may be available for your assignment, depending on the assignment submission type set by your instructor. Not all of your assignments may be submitted online. If you cannot see the Submit Assignment link, your instructor may want you to submit your assignment in a different way or the availability date has passed. View the description of the assignment for instructions, or contact your instructor for assistance. Note: You can also access your Assignments through your user or course dashboard, the Syllabus, Gradebook, Calendar, or Modules. Click the name of an assignment. To submit an assignment, click the Submit Assignment button to submit your work. 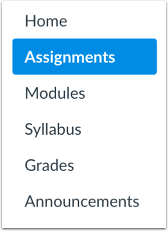 Note: If you cannot see the Submit Assignment button, your instructor may not want you to submit your assignment online or the availability date has passed. View the description of the assignment for instructions, or contact your instructor for assistance. A banner may appear above your assignment to indicate that your instructor has removed the assignment from total grade calculations. However, this setting does not affect assignment submissions. Your instructor will decide what kinds of submissions are appropriate for each Assignment. There are four submission types: upload a file, submit a text entry, enter a website URL, or submit media. Note: Not all file types may be available for your Assignment, depending on the assignment submission type set by your instructor. To upload a file from your computer and submit it as your assignment, select the File Upload tab. To submit a text entry assignment, select the Text Entry tab. 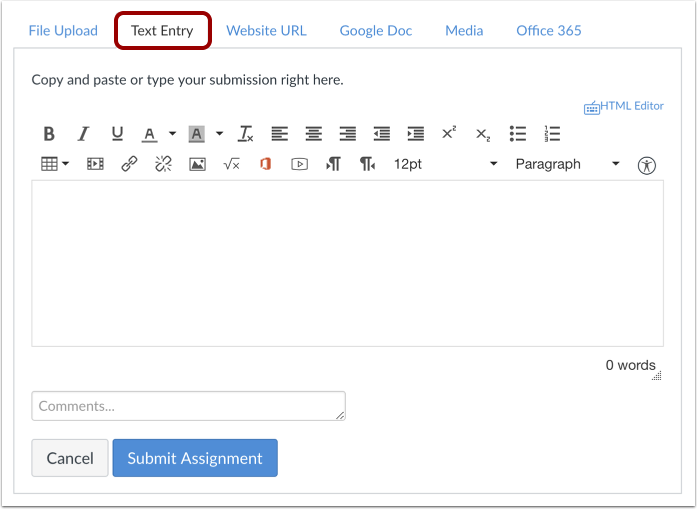 Note: The assignment submission Rich Content Editor includes a word count display below the bottom right corner of the text box. To submit a website URL, select the Website URL tab. To submit a media recording, select the Media tab. When you are ready to submit your assignment, click the Submit Assignment button. After you have submitted your work, you will see information in the Sidebar about your submission . For file uploads, the sidebar provides a link to your submission to download if necessary. If you choose, you may resubmit another version of your assignment using the Re-submit Assignment button . You will only be able to view the details of your most recent submission in the Sidebar, but your instructor will be able to see all of your submissions. 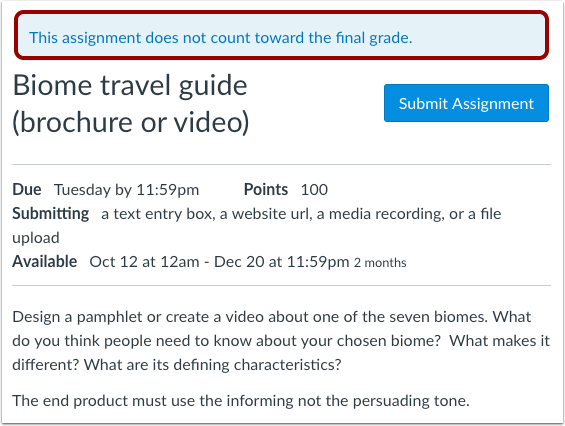 Once the instructor has graded your submission, the Grades link in Course Navigation displays a grading indicator. You can also see details about your assignment and links to additional feedback in your Grades page. Your assignment will still appear in Assignments and the Syllabus; the listing is not removed with assignment submissions. When you resubmit an assignment, you can only access and view your most recent submission. However, instructors can view all of your submissions. Previous Topic:How do I view the rubric for my assignment? Next Topic:How do I view the rubric for my external tool assignment? Table of Contents > Assignments > How do I submit an online assignment?